What Do You Have In Mind For Your Little Boy? Living A Wicked Fresh Moments! Justice No More For Lauro Vizconde? Are You Still Single and Available? Where Will You Gonna Spend Your Holiday? Christmas is in the air, indeed! We can already hear the Christmas carolers parading into our neighborhood. As early as now we should be ready with our list for Christmas gift shopping. This is the only time of the year that the spirit of giving is evident to most of us. To avoid rush Christmas shopping, it is more practical that as early as now, you start buying the things that you will be busy wrapping about in the coming days. I for instance, I already started drafting the list and to my amazement, I just realized that I already have more than ten Godchildren, most of them are boys. The only thing that the kids will surely appreciate upon receiving and unwrapping their Christmas presents are toys! Yes indeed, even big boys love toys too! I have here some list of toys that will surely be a hit this Christmas season. Gift giving is not only the main highlight of the season; merrymaking is of course on top of the priorities. I tried to browse for list of saleable Christmas toys wherein it is not too much for the pocket. So here goes my list in ascending order as to the prices. Each member of the family needs to spend quality time together. One way of doing so is by playing together. This activity has been proven to be effective all the way. There are other ways actually wherein the family can bond together like outdoor adventure. But for the coming holiday, indoor games can be a good substitute too. This Christmas season, why not give a game board like Monopoly Revolution to one member of the family wherein everyone has the opportunity to enjoy. Aside from being practical, this is such a good game board that can be played anytime, not only during Christmas season. Monopoly Revolution is the newest addition to monopoly to celebrate 75 years, the traditional game has been updated with a round board and all new graphics such as an electronic banking unit with built in songs and sound effects, a perfect game to play with the whole family this Christmas while waiting for the Noche Buena. Monopoly Revolution is easy on the pocket. It only cost £30.00 or roughly $48.00. Isn’t it nice to exercise your business technique skills and have it shared to your family? Who knows, you might end up engaging in real estate businesses because of the influence of the Monopoly Revolution game. If you want your kid to become an instant rock star celebrity, then Paper Jamz Guitar by Wowee is just the right one for him this Christmas season. Paper Jamz Guitar offers children an instant rock experience, it is computerized and allows youngsters to play along to pre-programmed tunes or just create their own, it also comes with headphone's so will not annoy parents with the constant noise. With the given feature, your kid will be trained and have the opportunity to become one great musical artist someday. This guitar is ideal for those beginners in guitar lesson. All parents love to see their children bringing down the house in excitement and entertainment during the Christmas celebration. Unleash the hidden musical talent of your child and allow him to be himself with this guitar. What is more amazing is that, you do not need to spend much for such a great item, with just £32.00 or more or less $51.00 price for Paper Jamz Guitar, you could never go wrong. This is something that they can be proud of and they can carry this anywhere, giving them a lot of opportunity to showcase their talents. Make this season a memorable one for your kiddo. Who can afford to say no to Baby Annabell for gift this Christmas? This cuddly Baby Annabell Version 5 by Zapf Creations is an 18inch doll that acts just like a real baby. She has similar characteristic to a real baby. She can drink real water from her bottle and makes sucking noises whilst drinking she will then burp and fall asleep. If she's upset she will even cry real tears, but singing soon hushes her. She is even alert to sound or movement and wakes up if someone makes a noise. When she sleeps she closes her eyes and you can hear her breathing, sometimes gently snoring. This will surely be a crowd-getter, attention-seeker among the family because of its unique features. If you are in a family where no more babies can be seen because all have grown up, then maybe this gift will help you bring back those good old days. Do not let that camera click without Baby Annabell on the lap of Mom. Your little kiddos will not get jealous on her; nevertheless, they would surely love her like for real. Baby Annabell comes in a very affordable price of £45 or more or less $72.00, too little amount for such a precious new member of the family. Welcome her with a smile. 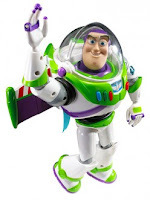 If you want to go with the latest craze nowadays, go for the toy that is tipped to be the biggest seller for Christmas 2010, it is none other than Jet Pack Buzz Lightyear by Mattel™. This is predicted by various toy stores including Hamleys’ to be this year's sell out. The 12 inch figure comes complete with a rocket pack incorporating after burner jet lights and sounds. It also comes with laser arm lights and retractable helmet. Give it to your little boy and he will surely jump for joy. Expect then that he will proud enough to bring this in school as soon as the holiday ended and the classes will resume. Since the start of the Toy Story 1 movie, Buzz Lightyear has became popular not only among little kids but with the adults as well. Its popularity continues with Toy Story 2 and now with the Toy Story 3 coming out on dvd, this toy is set to rocket in popularity for only £50.00 or $80.00. Grab it now before you will be run out of stock. Remember, the fact that this was predicted as the best-selling Christmas toy, so hurry don’t wait for December to come. What goes into your mind when buying a toy for your little princess? Little girls, and even big ones, love to play dolls. Speaking of dolls, top on the list is Barbie. Barbie brand never went out of style nor became obsolete in the market. What is more fascinating about this doll is that every year, they never run out of ideas as to the innovation that will surely capture the taste of everyone. The latest so far that will surely become popular for the girls this Christmas is the Barbie™ Video Girl. This Cool Barbie doll has a video camera inserted into her back, with an added feature of instant playback. Children who are blessed enough to own this masterpiece said they love the new Barbie doll and having a camera in her back makes her even better and lovable. Make this year as one of the most memorable celebration for your little princess by giving her this fashionable doll that has a very renowned fashion statement that could influence your little princess’ sense of style. Barbie Video Girl only costs £75 or roughly $120.00 but equivalent to thousands of hugs and kisses from her. Above all, let her capture your smile as she will take video of you. Well, what are you waiting for? Go ahead and start picking your choice!